The past few years, I’ve been a reading slacker. Oh, I keep tabs on the books I want to read. My Goodreads shelf of to-read books is crammed full; in addition to all the books I think I should read (like classics and best books of the year), every other book a friend recommends goes on my list. I’m also a sucker for a good review, so anything wildly popular goes on there, too. And don’t even mention all the free Kindle books that Amazon stocks. It’s fair to say that I won’t get through all of the books I want to read in this lifetime. This year I gave up all that nonsense and went on a book-reading tear. I gave myself a goal of reading two books a month, and let go lofty aspirations of reading literary tomes in favor of blowing through young adult fiction, Amish romances, and fun biographies. Right now I’m in a phase of reading old books that I should have read but never did. 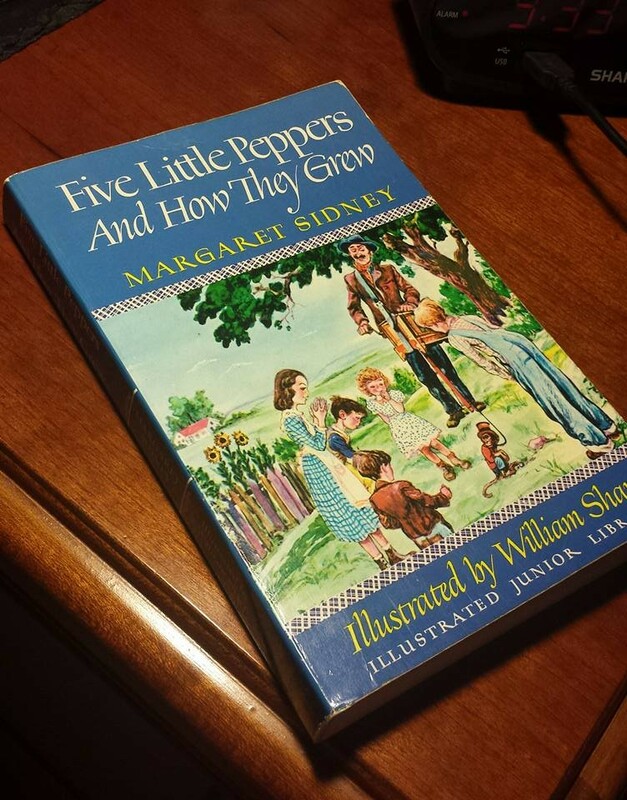 I finally picked up Five Little Peppers and How They Grew, a book I got as a gift when I was seven, and which I hauled through life and never opened. 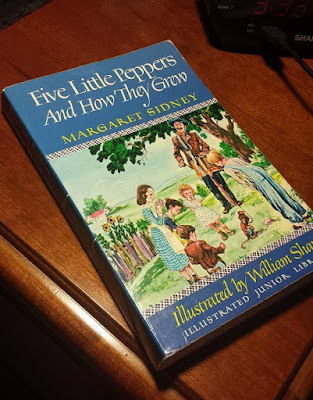 Written in the late 1800s, it’s a gentle story about the poor Pepper family of five children whose days are spent helping their mother Mamsie, which is probably the most important thing for children to do in life. The Peppers sew and bake cakes and help neighbors chop wood and whole chapters are devoted to activities like writing a letter and hanging up stockings for Christmas. The whole family sees the world through bright shining eyes and each member is extremely polite and mannerly to each other and strangers, and they dressed well despite having nothing, and they appreciated the little they had, and they filled my heart with such joy that at times I cried. I DID. I’m so glad I never gave up this book. I can’t wait to give it to my daughter when she moves away so it can sit on her bookshelf for thirty-five years, unopened. Then I read Jane Eyre along with my son, who was given the assignment for English class. I’d not read it before, not having the assignment when I was in school. Its Gothic appeal caused me to finally see what the hubbub was all about. I really liked this book, taking into account Jane’s feminist leanings and her strong moral core, and the fact that she was a sass talker at a time when women’s main occupation was finding a man, one who ostensibly didn’t want his wife to have a voice about things. Jane was also a fine dresser, despite most of her clothing being long and black. Shockingly, my 14-year-old son did not like this book as much. Now I’m in an Anne of Green Gables spiral, laughing and crying at Anne Shirley’s over-the-top poetic descriptions of nature in her small life, the chapter titles that just go right on ahead and tell you what’s coming (“Matthew Insists on Puffed Sleeves”) and Anne’s blathering on and on about what it is she’s imagining from moment to moment, usually dying romantically or finding fairies somewhere and generally exasperating yet stealing the hearts of every single person she meets. She is 1900s Spongebob in red hair and blue muslin. I’d also like to mention that once Anne’s caretakers get the hang of things (i.e., puffed sleeves), she is also quite the snappy dresser. Reading these old books has transported me to a time when people had manners, dressed well and appreciated what they had. They apologized, and held real conversations, and expected their children to do the same. I’ve been thinking that everyone should take a page out of the last three books I’ve read and adopt some of this late 1800s-early 1900s behavior. It sure would make daily life a lot more pleasant if people treated each other like fellow worthy humans instead of wild raccoons. I missed this when I didn’t read. To be taken to another world, if only for a little bit of time each day. To laugh and cry and see what can happen if only in the imagination. That reading enriches your life is something that has been known forever, yet I let go this opportunity when I didn’t read as much. I might stop reading oldies but goodies after I finish up with Anne (there are only so many children’s books you can read in a row, even with plain ol’ Jane Eyre thrown into the mix) but I’m going to keep going this year. 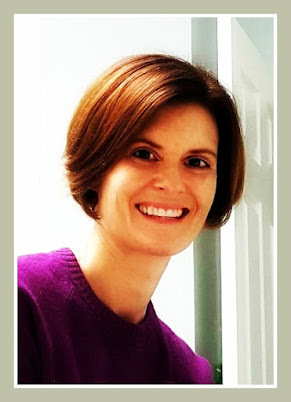 I’m up to 29 books already – maybe next year I’ll double my goal. What have you read this year? Share your favorites!